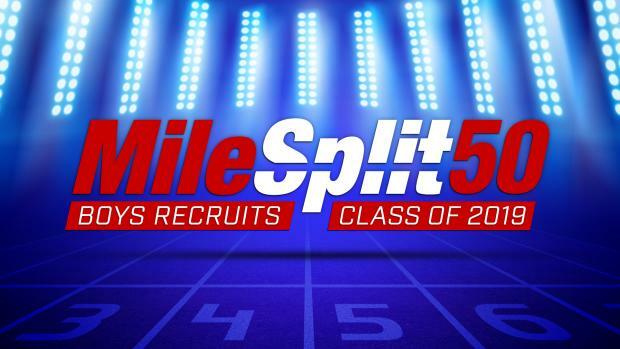 MileSplit has made a subjective ranking of the top 50 boys recruits in the Class of 2019 ahead of the National Letter of Intent signing period, which begins November 14 and runs through August 1. We ranked our top 50 athletes based on a tiered rating system, current MileSplit50 track and field and cross country rankings, state records, historical results, and performances over national competition. One of the top sprint recruits in the nation. He has clocked top all-time marks indoor in the 200m (20.95), 300m (32.64), and 400m (46.31). His 300m mark is the high school national record. Kurt Powdar is just off the top 10 all-time list in the 55mH. He's run 7.09 indoors in the event and holds an outdoor PR in the 110mH of 13.59. His 13.59 won New Balance Nationals Outdoor last spring. Nick Foster is one of the best distance recruits in the class of 2019. He's run PRs of 4:05.50 in the mile, 8:54.80 in the 3200m, and 15:03.10 for 5K in cross country. Heslop is one of the top guys in the class of 2019 in everything from the indoor 55-meter dash indoor to the 400m outdoor. He finished fifth last year in both the 60-meter dash and the 200m dash at New Balance National Indoor. Cooper has age group and class national records to his name. He is one of the top recruits in the nation in the 100m, 200m, and 400m. Oosting had a strong junior season in track where he clocked some of the top times in the nation in the distance events. He holds a PR of 8:53.46 for 2 miles and has clocked a 4:14.09 in the full mile. Sean Dolan is one of the most well-rounded mid-distance runners in the class of 2019. He holds some of the top times in the nation. His times in the 800m indoors and outdoor are top five in the nation. His outdoor mile time of 4:08.86 is fifth best in the class of 2019. He ran that time to place second at the adidas Boost Boston Games. His indoor mile time of 4:16.68 ranks 10th in his class. Peralta is the best 800m runner in the class of 2019 with times of 1:51.74 indoor and 1:49.10 outdoor. His mile time sits a little lower on the list at which is why he is behind Dolan in the rankings. His consistency in the 800m is strong with five times sub-1:50 or better, not to mention he was the New Balance Nationals Outdoor champion in the event. Drew Bosley made a statement last year clocking a 14:32.75 for 5K on the track to win the USATF Junior Outdoor Championships. Not to mention he placed 11th at the Great Edinburgh XCountry in Edinburgh, Scotland last fall and is ranked MileSplit50 No. 1 this season. Liam Anderson finished third last year at Nike Cross Nationals and hasn't looked back since. During his junior year track season Anderson clocked an 8:52.74 in the 3200m for the fastest time in the class of 2019 as well as a 4:09.31 in the 1600m to win the CIF State Track and Field Championships. Taylor Banks is one of the nation's best sprinters with some of the top outdoor times in the class of 2019. He's run a FAT wind-legal 10.26 in the 100m and a FAT wind-legal 21.18 in the 200m. Nick Ramey is one of the top sprinters in the nation. Both on the track indoor and outdoor Ramey has excelled clocking times of 21.73 for the 200m indoor and 21.14 outdoor. He's also run 46.78 in the 400m indoor and 46.20 outdoor. He's just off the top 10 all-time in the 400m indoor. Devin Hart may best be remembered for his crazy double last season when he ran 8:53.36 for 2 miles at Brooks PR and then flew across the country back to New Jersey where he ran 8:58.58 for 3200m. Hart also holds a 5K track PR of 114:44.06 which he ran to place third at New Balance Nationals Outdoor in 2017. Turay had a strong showing last year and has emerged as one of the top hurdlers in the class of 2019. He's run 13.73 FAT wind-legal in the 110mH and 37.72 in the 300mH. What ranks him ahead of other hurdlers in his class are his PRs not only outdoor but also indoor as well. Willis the NYSPHSAA - NY state champ in the long jump and triple jump has some of the best wind-legal marks in the class of 2019. The Cicero-North Syracuse senior jumped 49 feet 9.25 inches last spring in the triple jump and 24 feet 3-inches in the long jump. Willis has also performed well indoors with marks of 24-5.5 in the long jump and 49-5.75 in the triple jump. He also has solid times in the 100m, 200m, and 300m indoors. Connor Nisbet tops the class of 2019 in the indoor 5K and is well-rounded in other events both indoor and outdoor. He leans toward being a stronger runner on the track but has some solid cross country performances as well. He holds PRs indoors of 4:18.30 in the 1600m, 9:23.52 in the 2-mile and 14:44.82 in the 5K. His 5K time earned him second at New Balance Nationals Indoor last March. Outdoors he's run PRs of 4:12.21 for 1600m, and 9:04.73 for 2-mile. Daniel Maton is a strong 800m/1600m runner who ranks top 10 in the class of 2019 outdoor for both events. Maton has clocked outdoor PRs of 4:08.13 in the mile and 1:50.79 in the 800m. Indoors he's run 4:16.68 in the mile and 8:42.23 in the 3000m. Farmer is the top pole vaulter in the nation with his vault of 17-feet four inches. He has two other performances over 17 feet including a 17-3 and a 17-1 which he vaulted to place second at New Balance Nationals Outdoor. Manson is not far off of Farmer in the pole vault with his mark of 17-3.5 which he vaulted to win the Colorado State Track and Field Championships. Manson has two vaults over 17 feet. Matthew Payamps may only have the 15th-fastest time in the 800m outdoor for the class of 2019 with his 1:52.51, but he has a 4:08.32 mile to back it up. His mile time ranks third in the class of 2019. Not to mention has 8:56.06 3200m performance last may at the 51st Glenn D. Loucks Games. Joseph Fahnbulleh has some of the top sprint times in the nation. In the 100m he's run all-conditions 10.54 and wind-legal 10.63. In the 200m he sits at the top of the class of 2019 after running a wind-legal 20.69 to win the USATF National Junior Olympic Track & Field Championships. Marshall has one of the top 110mH times in the nation with his wind-legal 13.87 from the USATF National Junior Olympic Track & Field Championships. He was also sixth in the 110mH at New Balance Nationals Outdoor in 2018. Boling is one of the top 400m runners in the nation. He clocked a 46.15 last year to win his region meet in Texas. He has a handful of other sub-47-second performances including a 46.76 which he ran to place second at the UIL Track and Field Championship. Boling can also triple jump as he has gone 23-11.5 wind-legal and over 24 feet wind-aided multiple times in his high school careers. Snyder has one of the top triple jump marks in his class. Last year the senior jumped 49 feet 3.25 inches to place third at the Bojangles Track & Field Classic. He's also jumped over 24 feet in the long jump three different times in his high school career. Lewis has clocked some of the top sprint times in the nation. He holds a wind-legal PR of 21.02 in the 200m which ranks seventh in the class of 2019. He's also run a wind-legal 10:54 in the 100m; he ran that time in the prelims of New Balance Nationals Outdoor. In the finals at NBNO, he ran 10.57 to place fifth. He's a four-time AHSAA State Track and Field 4A-7A including one 100m state title, one 400m state title, and two 200m state titles. Jackson has wind-legal PRs of 10.46 in the 100m and 21.22 in the 200m. He was last years AHSAA State Track and Field 4A-7A 100m state champion. Brockman ranks among the top in his class for the high hurdles. He has the third-best 110mH time with his 13.86 from the 2018 Atlanta Georgia Relays. Hudson tops the shot put rankings for the class of 2019 with his mark of 65-6.25 which he threw to place fifth at New Balance Nationals in 2018. He also ranks third in the class of 2019 for the discus with a mark of 198-1. He threw that to place second at New Balance Nationals Outdoor last spring. Jackson has one of the top wind-legal times in his class for the 200m dash. The senior clocked a 20.75 in the 200m last April to win his district meet and qualify on to the Texas State meet. In the 100m Jackson has run an all-conditions PR of 10.50. McRae has run everything from the 100m to the 1500m but some of his best marks have come in the shorter distances. In the 300m indoors he's run 35.46 which ranks 24th in his class and in the 500m he's run 1:04.01 which ranks third in his class. Sam Affolder has been one of the top distance runners in the nation since his sophomore year when he finished second at the Foot Locker Northeast Regional. The Loudoun Valley senior holds indoor PRs of 1:56.32 for the 800m and 4:09.89 for the mile. Outdoors he's run 4:15.29 for the mile, 8:59.82 for 3200m, and 9:16.43 for the 3000m steeplechase. Cheeseman has been stellar on the cross country course. Last year as a junior he made it to both the national meets and placed 36th at Nike Cross Nationals and 6th at Foot Locker Nationals. This year he won the Great American Cross Country Festival one of the biggest meets of the season. He's also put up some big-time performance on the track as well running 4:12.20 in the mile, 8:57.33 in the 2-mile and 14:36.60 in the 5K. McBride has had strong performances in both the vertical and horizontal jumps. In the high jump, the Apex (NC) senior has 7-0.25 both indoors and outdoors. He also holds a solid mark in the triple jump with his all-conditions jump of 46-2 which he hit to win the NCHSAA 4A Mideast Regional meet. Fischer made it to both of the national cross country meets last year as a junior. This year he's looking even stronger than he did last year and looks to have a chance to do the same. On the track, he holds PRs of 1:55.06 in the 800m, 4:13.03 in the mile, and 9:18.35 in the 3200m. Furland is the top hammer thrower in the country with a PR of 219-10. He's thrown over 200 feet several times in his career including a throw for 210 feet and 11 inches which won him the New Balance Nationals title last spring. Stokes has one of the best 2K steeple performances all-time. The Maine-Endwell High school senior clocked a 5:53.74 to win New Balance Nationals Outdoors last year. He also has run some strong times in the 3K steeple (9:05.67) and the 3200m (9:11.26). He finished third last year at the Nike Cross Nationals New York Regional and went on to place 27th at Nike Cross Nationals. Cavanaugh is one of the top short hurdlers in the nation having clocked PRs of 37.20 in the 300mH and a 51.53 in the 400mH. He's not far off of being one of the top guys in the high hurdles as well with an all-conditions PR of 14.32 in the 110mH. Royal has the top wind-legal long jump mark in the class of 2019 with his jump of 24-4.5 from the USATF Junior Outdoor Championships. He finished third there with that mark. He was also third at New Balance Nationals Outdoor with a jump of 23-5. He's one of the nation's top jumpers both indoors and out. Carlos Aviles holds some of the top marks for the class of 2019 in the throwing events. He holds an outdoor shot put PR of 63-5.5 and a discus PR of 194-1. His shot put PR is fourth in the class of 2019 while his discus mark is sixth. Richards was sixth last year at New Balance Nationals Outdoor in the 400mH. He ran a PR of 52.59 to place sixth. He's also clocked some quick times in the sprints including a 34.60 in the 300m indoor and 47.96 in the 400m indoor to finish fifth at New Balance Nationals Indoor in 2017. Houston-Shepard has several times sub-14-seconds in the 110mH including his wind-aided PR of 13.60. He holds the second fastest time in the class of 2019 for the 300mH with his run of 36.76 from last years Victor Lopez Classic. He finished third at last years Class 5A UIL Track and Field Championship in the 110mH and second in the 300mH. Matthew Meinke is a strong distance runner both indoors and out. Indoor's he has clocked a 9:06.37 2-mile and a 14:50.10 5K. On the track outdoor he's run 9:06 for 3200m and 14:54 for 5K. He also has performed well in cross country finishing fourth or better the past two years at the WIAA State Meet. The Neenah senior also earned a bid to NXN last year after finishing 5th in the Heartland region he went on to place 28th at nationals. Rhea clocked a wind-legal PR of 13.84 in the prelims of New Balance Nationals Outdoor 110mH race. He then went on to run a wind-legal 13.96 to place fourth in the finals. Jake has been one of Tennessee's top distance athletes over the past few years. The senior has run 4:12.13 in the full mile, and 9:13.90 in the 3200m. He's placed top 20 or better every year at his TSSAA State Cross Country Championships earning the win this year running 15:25.58. He has two TSSAA State Track and Field Championships titles one in the 1600m from 2018 and one in the 3200m from 2017. Not to mention he has an 800m PR of 1:53.19. Rizzo has run some of the top times in the nation for 800m's. Indoor's Rizzo holds a PR of 1:52.55 which he ran to place seventh a tNew Balance Nationals Indoor's last year, that's the fourth fastest indoor 800m time in his class. He's run about the same time outdoor with his 1:52.51 from the Saint Anthony's Invite last May. Sam has posted some solid times in the distance events including a 4:13.43 in the mile and 4:01.09 in the 1500m indoors. He was seventh in the mile at NBNO last year. with his mile PR. Patrick Piperi has strong marks in both the shot put and discus. He placed second last year in the shot put at the Class 6A boys UIL Track and Field Championships throwing 62-10.5. In the discus, he placed third throwing a PR of 184-feet. He ranks sixth in the class of 2019 for the shot put and 18th in the discus. Trevizo has the top high jump mark in the class of 2018. At the Texas Region 1-2A Meet, last April the Farwell (TX) senior jumped 7 feet 1.5 inches. He has several jumps very close to the seven-foot mark as well including two 6-8 performance and one 6-9 performance. Shea has strong times in everything from the mile indoor (4:15.88) to the 3200m outdoor (8:59.46). He was the NYSPHSAA State Champion in the 3200m both indoor and outdoor in 2018 and made it to NXN during the 2017 cross country season where he finished 69th.